BOSTON?/span> IS YOUR BEST SOURCE . . .
Boston miter and bevel gears are designed for transmission of motion and power between intersecting shafts positioned at a right angle. Straight tooth miter and bevel gears are cut with a generated tooth form having a localized lengthwise tooth bearings known as the ?Coniflex tooth form. The superiority of these gears over straight bevels with full length tooth bearing lies in the control of tooth contact. The localization of contact permits minor adjustment of the gears in assembly and allows for some displacement due to deflection under operating loads, without concentration of the load on the end of the tooth. This results in increased life and quieter operation. Spiral tooth form miter and bevel gears are suited for higher speed and larger torque applications. Boston stock miter and bevel gears are designed for transmission of power and/or motion between intersecting shafts at a right angle (90?). Miter gears ar a special type of bevel gear designed to operate as pairs being identical in number of teeth and pitch (1 to 1 ratio only). 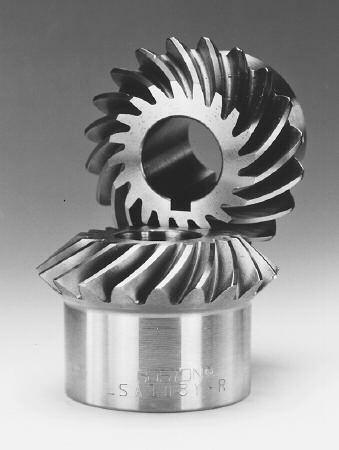 Other Boston stock bevel gear sets are available with ratios from 1-1/2:1 to 6:1. All Boston standard stock bevels and miters are manufactured with a 20?pressure angle. 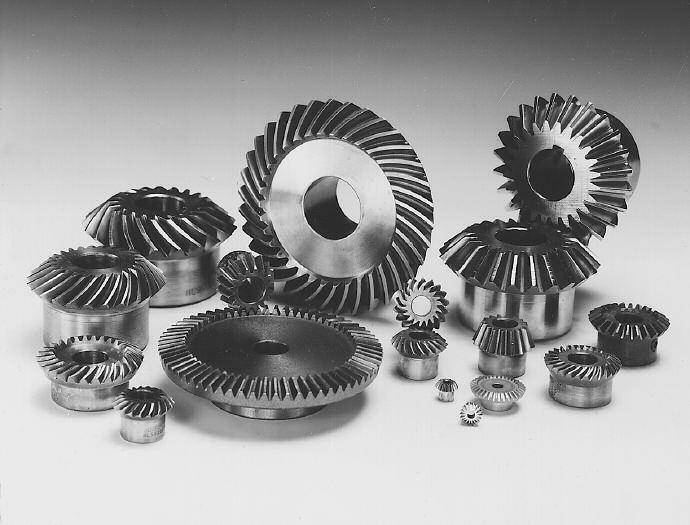 These bevel gears are made in accordance with AGMA specifications for a long and short addendum system for gears and pinions, which serves to reduce the amount of pinion tooth undercut and to nearly equalize the strength and durability of the gear and pinion. Boston straight tooth bevel and miter gears have generated teeth with ?Coniflex tooth form, unless otherwise specified. Stock miter and bevel gears having identical diametral pitch, number of teeth and mounting distance (and spiral angle for spiral bevels) are interchangeable. Boston standard stock straight bevel gears can be used for all applications requiring transmission of power and motion between intersecting shafts. Boston standard stock spiral bevel gears have an overlapping tooth action which results in a smoother gear action, lower noise, and higher load capacity than a straight bevel of equal size. Approximate horsepower ratings for selected sizes (number of teeth) at various operating speeds (RPM) are given for Boston standard stock Bevel and Miter gears. For straight tooth Miter gears, refer to Pages 68, 69. For straight tooth Bevel gears, refer to Page 70. For spiral tooth Miter gears, refer to Page 71. For spiral tooth Bevel gears, refer to Page 71. All ratings are based on normal operating conditions, that is: properly mounted and lubricated, carrying a smooth load for not more than 10 hours (Service Factor = 1.0). 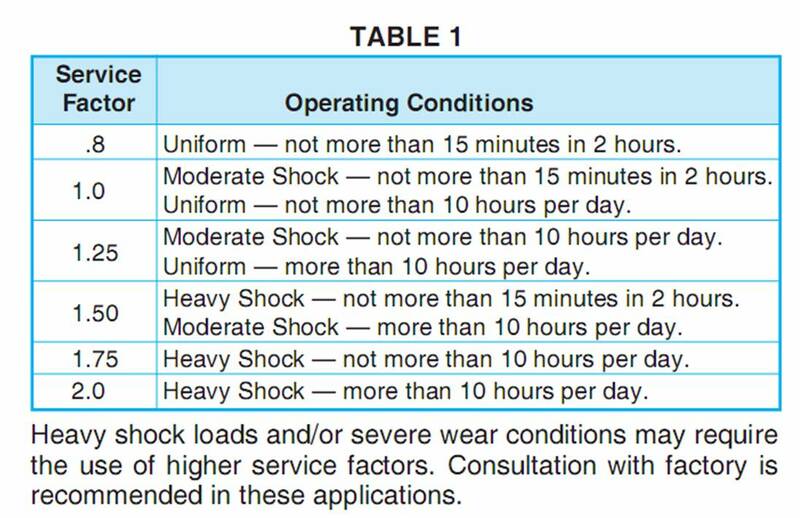 Refer toTable 1 for service factors in other service conditions. 3.Select a gear set with horsepower capacity equal to (or greater than) design horsepower determined in Step 2.